Jim Popso and His Coal Country Folk Art - part 1 at Artisans Gallery. CALL 256-886-2809. Our thanks go to both the Author and the Pennsylvania Folklife Society. 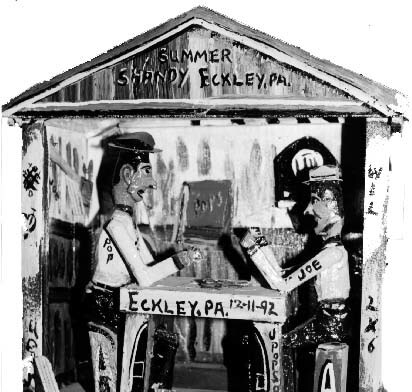 Located in Luzerne County, the heart of eastern Pennsylvania's coal fields, Eckley Miners' Village portrays everyday life in an anthracite mining town. The dwellings, churches and other structures date back to the mid-1800s, when the Council Ridge Coal Colliery and surrounding Eckley village were developed. Miners' families still occupy many of the company-town houses, while some restored village buildings and a visitor center and museum are open to the public. The site is administered by the Pennsylvania Historical and Museum Commission as part of the state's Anthracite Complex, a group of four sites and museums that preserve and interpret the region's heritage. In May 1991, I made my first visit to Eckley. The self-guided tour included the Museum Shop, which occupies the Company Store building. This structure is not historic, but a prop that was built by Paramount Studios in 1968 for the filming of The Molly Maguires. Eckley's museum shop was distinctive in that it lacked the usual collection of generic gift-shop trinkets. Instead, paintings and small handmade wooden models of coal mining equipment, village scenes, and miners dominated the shop's inventory. 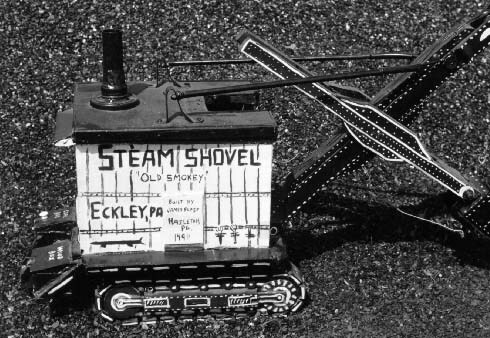 There was a model of the Mahanoy City coal operation, a painting of breaker boys picking slate, a steam shovel, a man pushing a wheelbarrow full of coal to his house, and even a memorial to union leader John. L. Lewis. One piece in particular caught my eye. It measured about two feet long by a foot high. On its back and a side were painted "Coal Cracker Model . . . By J. Popso, Son of a Coal Miner." In a hard hat, a grim miner sat atop the cracker with his shovel propped against his lap, waiting to shovel lump coal. A hand crank on one of the model's sides could be rotated to push rows of serrated rollers against each other, showing how lump coal was crushed in the cracker's hopper. From the bottom of the crushing mechanism, a chute directed cracked coal into two bins, one labeled cracked coal and the other labeled fine coal and dirt. Painted sketches of Eckley buildings -- the Mule Barn, the Breaker, and some houses.-- decorated the hand crank and most of the model's other available flat surfaces. The museum shop attendant explained that "J. Popso" was James (Jim) Popso, a retiree living in nearby Hazleton. Eckley Village had been selling his items for the past two years. I decided to try to track down Mr. Popso on my next trip through eastern Pennsylvania. Jim Popso's neighborhood, Hazleton Heights, is bounded by the downtown business district, an industrial park, and some abandoned strip mine sites. It was settled by the wave of immigrants that came to Pennsylvania's anthracite mines from southern and eastern Europe in the late 1800s and early 1900s. The Popso home on South Cedar Street is a duplex. Jim and his wife modernized the half they live in. The ground floor of the other half houses Jim's workshop and a laundry room. Steep steps climb to the door, then a short entryway leads the visitor past stacks of scrap wood in a storage area and into Jim's workshop. Lit only by a single bulb and a window facing the back yard, Popso's shop measures about 10 by 15 feet. Jim heats it with a coal stove that sits near one corner. Along the opposite wall, underneath the window, run two work benches. Their edges and surfaces worn smooth, the benches bear the gouges, scrapes, and paint splotches of Jim's labor. Wood scraps, a power drill, a glue gun, paint brushes, cans of enamel, and bottles of acrylic paint vie for bench space with Popso's creations in various stages of completion. The hand-held drill and a scroll saw mounted on one bench are the only power tools. Finished pieces cram the shelves above the work benches and sometimes mount the stairs that lead to an unused second floor. One wall sports photographs of Jim's work, some of it as displayed at the museum shop at Eckley Miners Village. A replica of the Hazleton school bus that Jim's daughter Jamie drives occupies a corner of the floor. Another wall is covered with over twenty small sketches and watercolors, many of them over two decades old. Most depict a single building or scene, ranging from a house across the street or the neighborhood's Ukrainian church to a view of silver mines in the Colorado mountains that Jim once visited. 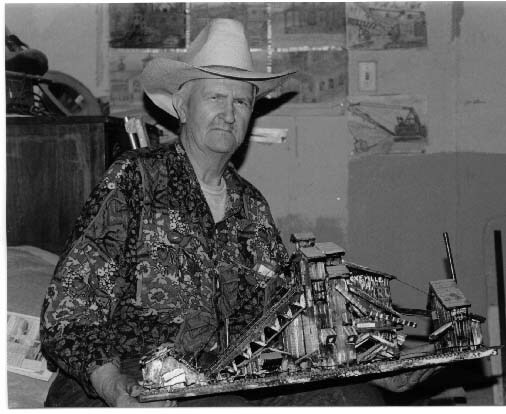 Although Jim Popso has been making paintings and miniatures for more than 20 years, this art is not widely known. However, Eckley visitors, folk art collectors, and art dealers are purchasing his work, and, judging by recent sales, its popularity is increasing. But it became clear to me that these collectible items represented more than goods of commerce, more than souvenirs, and more than objets d'art. Popso's work prompts questions about context, process, and culture. Why does he build his models and paint his paintings? How does he go about making them? What do these objects signify? In order to answer these and related questions, it was necessary to get to know Jim, his life, and his work. His gregarious welcome when we first met and an invitation to return opened the door to several enlightening visits that followed. James Popso was born in Hazleton in 1922, when coal dominated the region's economy. His father's parents had immigrated to Luzerne County from Austria-Hungary, and his mother's family had come from Poland when she was a young girl. Jim's father, who worked in the mines, taught Jim how to weld when he was nine years old. Welding proved to be an important part of the younger Popso's livelihood, one of several mechanical skills that kept him employed but away from the more dangerous work underground. When Jim was a teenager, he did what other adolescents only dreamt of -- he ran away with a traveling carnival. Performing talent didn't land him the job, though; it was his value as a jack-of-all-trades repairman. He fixed machinery, maintained the wagons, learned how to paint signs, and figured out how to repair broken animals on the carousel. The carnival's venues were mostly in the southern and middle Atlantic states, but the troupe also traveled occasionally to the West. Jim would return home from time to time, rejoining the carnival when its schedule brought it close to Luzerne County again. Later, a job offer at a Hazleton garage lured him away from life on the road. "I was a body man," Jim explains. "I used to weld all the fenders back together . . . and I rebuilt engines." Popso, still in his teens, started out part-time. Then the owner recognized his talent. "So he gave me a job steady, fourteen bucks a week. That was the biggest money I ever made in my life, [working] in a garage." Many of the vehicles he repaired were police cars. Jim began working at the mines when he was around eighteen. At a coal operation near Loomis, he tried digging in the tunnels as his father had done for most of his life. The new vocation didn't last long. "One day I worked there and goodbye. Too much dust. They would blast and these guys would run in there before the fans would take the dust and dirt and everything out. . . . They wouldn't wait 'til the air cleaned out because they were paid so much a carload. They wanted their money. It was so black you couldn't see the guy aside of you. I quit." Jim found employment in eastern Pennsylvania's anthracite mines off and on for many years, but he never entered the shafts or tunnels again. Instead, he drove trucks or built and repaired coal-processing machinery. In December, 1942, an induction notice came with the family's Christmas mail. Jim passed his physical and served at Fort Sill, Oklahoma, for about a year. Not surprisingly, the Army put him to work as a mechanic. Popso landed in an Army hospital when a truck he was driving collapsed a bridge. Recuperation took nine months, and then he was discharged and shipped home. After recalling the accident, Jim adds, "I don't even like to hear the name Oklahoma." Aside from a brief period working in an auto shop while living with his brother in New Jersey, Jim Popso has spent the rest of life in and around Hazleton. For 27 years, he welded at the Foster Wheeler Corporation's nearby Mountain Top plant. A contract engineering firm with headquarters in Clinton, New Jersey, Foster Wheeler produced specialized equipment for coal processing in its Mountain Top facility, which recently closed. Jim's varied resume since military service also includes jobs as a strip-mining equipment operator, night watchman, garage mechanic, and road crew worker. In addition, Popso was a local constable for more than two decades. He retired from Foster Wheeler in 1983 but continued part-time work as a peace officer for two more years. Jim Popso's artistic ability -- and his recognition for it -- can be traced back to his childhood. Several relatives painted, and as a young boy Jim received a set of watercolors from his father. In school, teachers provided additional encouragement. As Jim recalls, "I used to be the best [artist] in school and the teachers were crazy for my stuff. They used to take it home." One of his drawings earned Jim first prize (a dollar) in an elementary school contest. The winning watercolor was displayed downtown. While traveling with the carnival, he developed his technique further, repainting signs and repairing animals for the merry-go-round. Art, at an early age, not only fostered Jim's self-esteem, it also helped him earn a living. Creative skills in the Popso family extended beyond the two-dimensional world of painting. Jim always had access to a home workshop where, he remembers, "We made all kind of stuff, me and my dad. My dad was a blacksmith. He could make anything. And my brother [Joe] was a musician. He always made his own violins, and everything else he made himself. He never bought nothin'. And then he started to make mandolins, and then from mandolins he started makin' bass fiddles." Jim still has a wooden model of an oil derrick that Joe carefully cut, sanded and stained. Thus, making objects -- both aesthetic and utilitarian -- by hand was a Popso tradition that was passed along to Jim. Eventually Jim even fashioned many of his own hand tools. In his study of Indiana chain carvers, Simon Bronner discussed the workshop's importance in the lives of these elderly men. He asserted that shops provided far more than space for hobbies and home repair. About one carver, Bronner wrote, "Maintaining his carving allowed him time to escape to his workshop -- his individual, masculine space -- and to preserve his personal identity." To another chain carver, "[h]is basement workshop became his own small, private world filled with carvings . . . ."3 Similarly, Jim Popso's shop assumed a significant role in his adult life. "[When] I'd come home from work I could go in my little shop and sit, workin," Jim recalls. Like the shops of the chain carvers Bronner came to know, Popso's workshop enables him to establish a sense of who he is. It is a personal place, situated away from most family activities, that has become even more meaningful after retirement. While his wife Eleanor continues to work for the local school department and volunteer in the church, Jim paints and putters in his shop, creating things with value that others will affirm through their compliments and purchases. Big Al. That's a guy I knew. . . . See, when the coal inspector's checking, he takes the coal, a little bit out of each corner of the [mine] car and one from the middle somewhere . . . and then he puts it in a crusher and he crushes it to a fine powder. And then he burns it in a little bunsen burner and he tells the ash content. That's how they tell how good the coal is. And then they ship it to people and sell it. A painting of a double house situated along the main street in Eckley evokes other memories. "That house burned down a long time ago. I used to know that girl that lived in there . . . I never worked at Eckley mines, but I hauled coal from the strippin's [nearby]. . . . I used to come through there so fast I used to drive them nuts," Jim reminisces. "They'd be hollerin, they'd be out in the street with sticks after me." Popso's model of the colliery at Coxeville illustrates the range of materials he uses. A slab of half-inch poplar forms the base. The breaker and surrounding structures are made of pieces of hardwood, softwood, plywood, and veneer held together by wood glue and at least four different gauges of nails. Dowels, wood screws, brads, coat-hanger wire, and insulated wire represent smoke stacks, pipes, and electric cables. One of the few items Jim paid full price for is the HO-scale train track that runs alongside the breaker building and up from the mine shaft. The color scheme is black, gray, and silver, with a few daubs of reddish-brown paint on some of the dowels to represent rusting metal pipes. Much of Popso's wood is lumber yard scrap. In addition, he stops by the local high school's wood shop several times each week to get sawdust that his daughter Jamie needs for bedding her quarter horses. Here, Jim also picks up discarded pieces from student's projects. He has several other sources of wood as well. "I go by a house that's bein' rebuilt and look over the situation. The guy says, 'Take whatever you want.' Or say I find a bureau somebody threw away. I'll take all the good parts off it. . . . I use poplar, pine, it all depends, you know. Whatever I could get." Most of the metal he uses -- such as scrap iron, wire, and miscellaneous pieces of machined metal -- he finds or buys at local junk yards. Jim obtains his paint in much the same way. "I got a lot of friends at lumber yards," he explains, "and I go there and I say, 'OK, what's the deal?' 'Well, Jim, we got 15 cans of paint. You'll be wantin' them. They're full of dings and knocks. If you want the paint, ten bucks for the 25 cans.' So I give him ten bucks, I get 25 cans of paint. They're all different colors so you use it when you're paintin' a breaker or something." Although the imaginative, spiritual aspects of the work featured in the Ashe exhibit contrast sharply with Popso's more concrete creations, Jim and the group of African-American artists that Patterson discusses both engage in folk recycling. They take discarded commonplace materials and give them second lives as objects intended for education, contemplation, and/or aesthetic appreciation. In Jim's hands, a curtain rod becomes a smokestack, vinyl from a purse is fashioned into a horse's ears and rigging, a political campaign sign furnishes rows of roof shingles, and scrap plywood becomes the walls of a house or the surface for a painting.